EFree theorists led by Postdoctoral Associate Hanyu Liu predicted that by tailoring the pressure and composition of a mixture of hydrogen and rare-earth elements, exotic metals would be created, some of which would remain superconducting to nearly room temperature. Their results were published in H. Liu et al., Proc. Natl. Acad. Sci. USA 114, 6690-6695 (2017)]. New experimental work from EFree shows that the theorists were correct in at least one of their major predictions. By compressing lanthanum metal in a hydrogen medium to 170 GPa and pulsing temperature to 1000 K, the experimentalists were able to stabilize a cubic structure of lanthanum in which the hydrogen “pushes apart” the lanthanum atoms to much larger interatomic distances than expected in pure lanthanum. The x-ray transparent material is inferred to be a high density of hydrogen atoms, creating a material with H:La ratio between 9 to 12., with the best estimate being 10+/- 0.5. The theoretical calculations predicted the stability of a cubic lanthanum hydride LaH10 with a density that is nearly identical to that observed experimentally. The new experimental finding thus verifies one major prediction of the prediction. In addition, the experiments reveal that the material transforms on decompression to new superhydride phases that were not predicted in the original theoretical calculation. The experimental study is motivating important further work. Now that the synthesis route is known, the EFree experimentalists are hard at work characterizing the physical and chemical properties of the synthesized material. EFree theorists are working to understand the experimental observations that had not been predicted, such as the relatively low pressure of stability found experimentally. The experimental work is published online at http://onlinelibrary.wiley.com/doi/10.1002/anie.201709970/abstract. Image Captions: (Top Right) Schematic of the synthesis. Lanthanum atoms are in green, hydrogen atoms in pink. 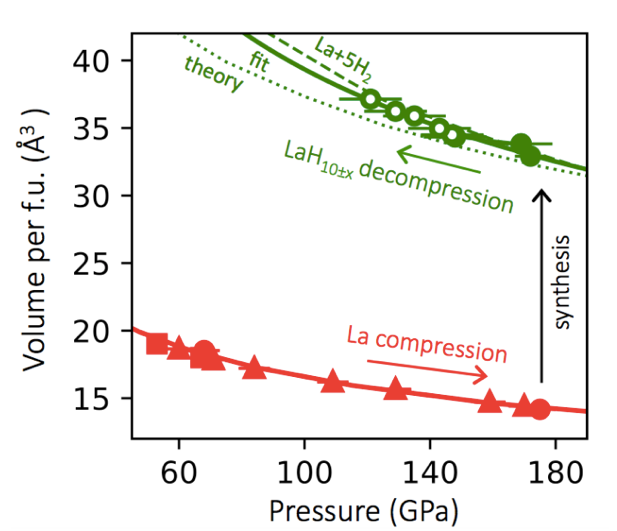 (Bottom) Pressure – volume relations at 300 K for lanthanum (red) and lanthanum hydride (green).